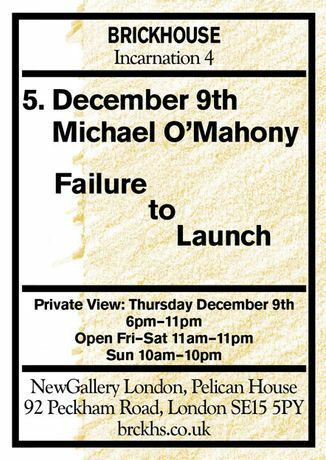 Failure to Launch, an exhibition of new works opens at New Gallery London as part of BRICKHOUSE Incarnation 4. Opening and private view on Thursday 9th December, 6:00 - 10:00pm. BRICKHOUSE is a short-living gallery, curated by Guy Gormley, making fast programs of exhibitions, usually with young artists. The gallery temporarily occupies spaces, it does not have a permanent location. Incarnation 4 sees a new solo show installed each week throughout November and December. Recently shortlisted for the Jerwood Drawing Prize 2010, artist Michael O'Mahony's work is personal and funny. His BRICKHOUSE show at New Gallery London, Failure to Launch, will see him explore his experiences of living with his parents in Palmers Green, London, where he has lived since childhood. In a sense, all of Michael's work is about himself, drawing and re-drawing himself in different scenarios and giving himself characters to act out. Through this personal study Michael gives us a unique and human insight into his life but also our own and how we live now. See a recent work "The People's Church of Montessouri" here: http://www.youtube.com/watch?v=h9h7XJn-hsY ---------------------------------------------------------- New Gallery London is a fully licensed bar and restaurant. Open 11am - 11pm (10am - 10pm Sunday) Last BRICKHOUSE Incarnation 4 show Ocean Mimms opening December 16th www.brckhs.co.uk/ www.newgallerylondon.co.uk Ground Floor, Pelican House, 92 Peckham Road, Peckham, London SE15 5PY Buses 12, 171, 343, 345, 36, 436, N136, N171, N343, N89.